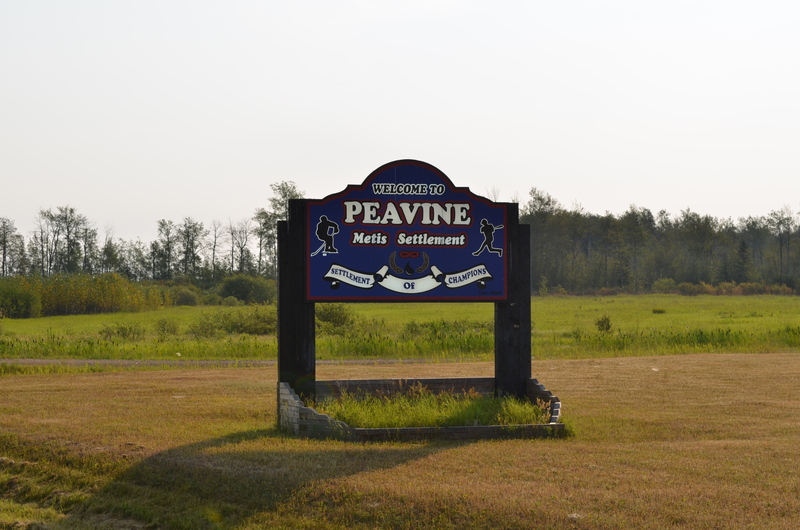 Located 56km north of High Prairie, and near Grouard, Alberta, is Peavine Settlement (formerly Big Prairie). 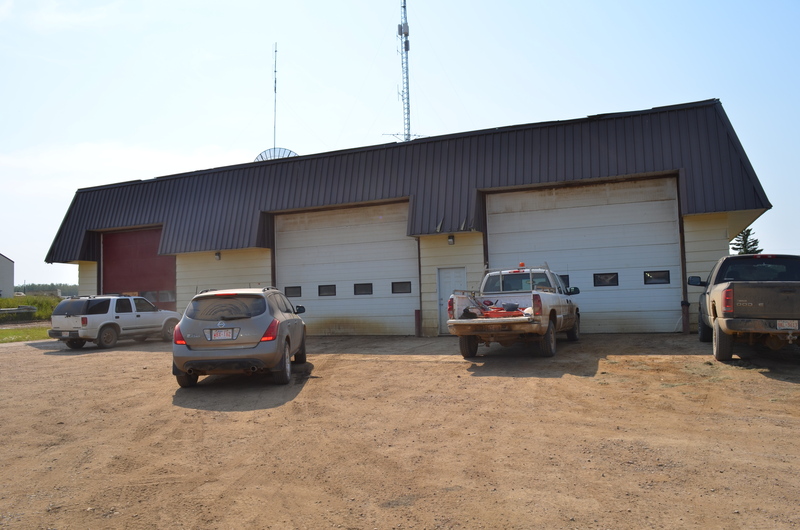 Peavine has a population of around 1000 people and primarily consists of a central community area (including recent school and community centre projects) and outlying acreages (this video provides a decent introduction to the community). The built environment of Peavine is similar to the other settlements, with a combination of older log and timber frame structures and more recent homes and industrial buildings. Similar to Kikino, for instance, there are various examples of log construction scattered throughout the settlement, both old and new. And also similar to the other settlements, residents demonstrate pride in their history of building from the land. 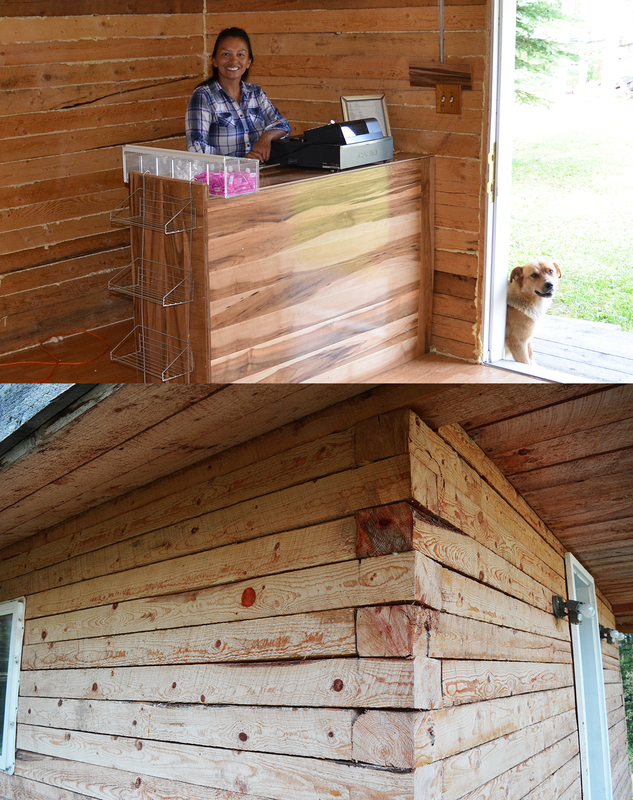 Sheila Knibb, whose grandfather Alcide Beaudry was a prominent local leader, proudly noted how her mother, Yvonne, built a log convenience store with little assistance. Cardinal’s designs, though never implemented widely, demonstrate an innovative architectural solution that both keenly responds to the existing cultural and environmental conditions at Peavine while explicitly striving to avert dependency on outside contractors and ‘experts’ to build homes on the settlements. Instead of considering how a solution like Cardinal’s could have provided comfortable homes while being consistent with the cultural and environmental context of the community, and similar to the other settlements, various types of pre-designed homes were approved through the CMHC and offered to the residents through the various government-funded housing programs and supplied by manufacturers and builders. Some of these have been maintained while many others have been abandoned for newer and larger homes. A recurrent situation with this upgrading has been to build a newer home beside the older one which eventually becomes used for storage. As Knibb describes, people at Peavine “keep shifting things around rather than maintaining them.” Many structures are scattered throughout the settlement with no indication for reuse (other than storage) or for the repurposing of materials. Within the centre, a variety of buildings serve the needs of the community from a residential-type administration building to more industrial-type community centres. 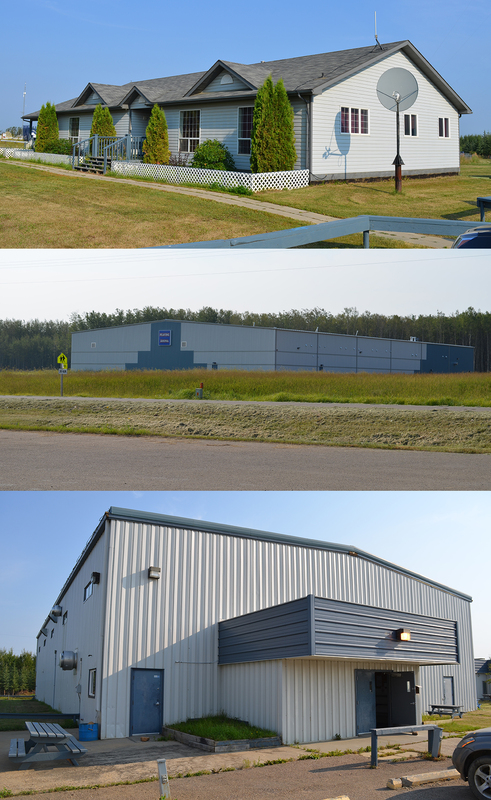 The community rink (image below – middle), which is essential to the athletic reputation and aspirations of the settlement (“The Settlement of Champions”), is used only during the winter months and sits unoccupied during the summer. A modest modern church is also nicely tucked into the trees at Peavine and is still in use. Angled walls frame clearstory windows that run as bands along the sides of the building, while a minimalist steeple rises from the blue metal roof. Peavine’s school, Bishop Routhier, is another example of recent government investment into the settlements and it is worth reflecting briefly on the role of the schools on the settlements. 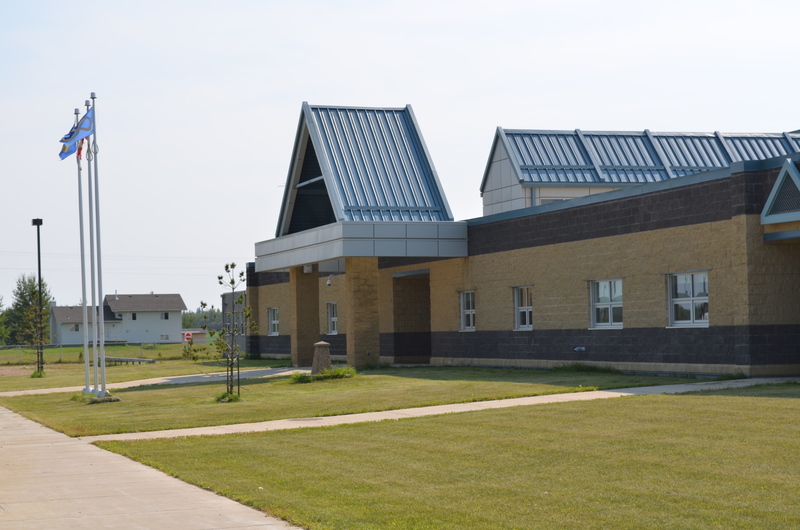 Education has been a long standing priority for residents from the pursuit of the land from the government during the 1930s to the 1960s when the Northlands School Division was established. The “first official trustee” of the division, Dr. J. W. Chalmers, wrote this of the status of Métis education at the time. As with the other settlements, schools have often become the cultural centres and among the highest quality buildings within these communities. 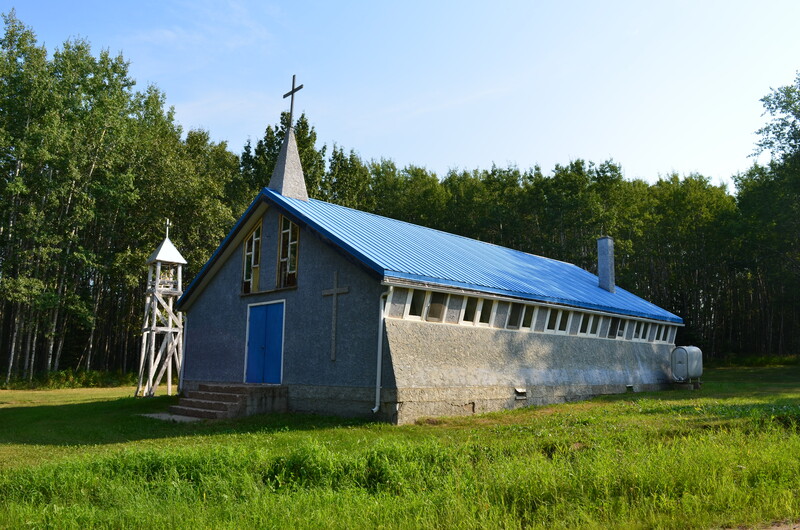 While Bishop Routier’s blue metal roof, similar to the administration building at Buffalo Lake, references the colour of the Métis flag and the horizontal masonry conjures up images of the sash, there is little explicitly Métis evidenced in its overall design intent. In addition to addressing the above concerns for maintenance, roads, skirting and porches, and landscaping, the committee makes the following recommendation regarding the mobile homes. It is clear that teacher housing has improved since the 1970s when the school division was still in its fledgling stages and administrators were still determining how to improve housing – something a school division is not typically responsible for. However, the above report clearly indicates a lack of design intent in both the planning of the teacher housing areas and in the construction of the housing at the time. Today there are still no developed roads, sidewalks, very little landscaping etc. so this report did not have a major impact on teacher housing at Peavine moving forward. More research needs to be done on the overall planning of the settlement to better understand the obstacles that may prevented more coherent planning initiatives. 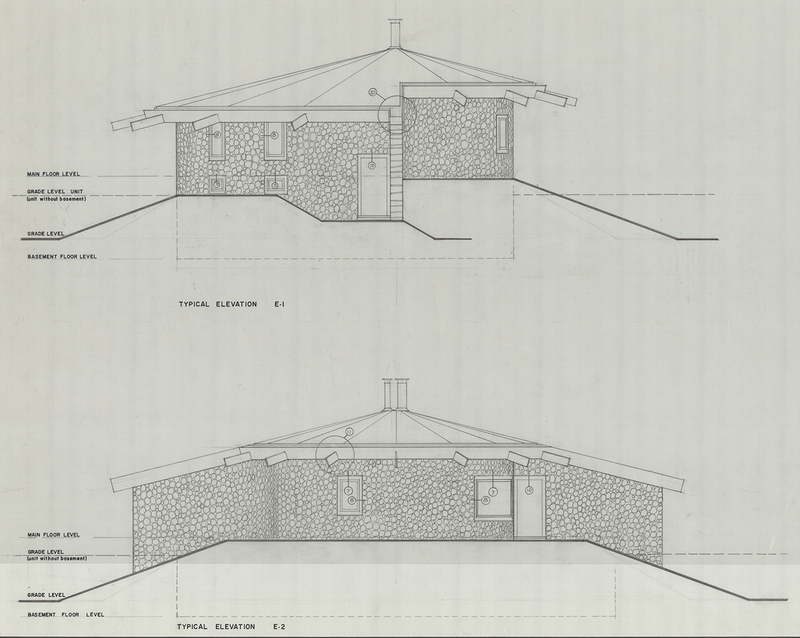 However, there are many revealing points made in this document linked to the role of architectural design and its impact on the Métis settlements. There is a clear suggestion that the teachers deserved attention to ‘factors of an aesthetic nature, or combined aesthetic and useful’ due to their ‘middle-class’ expectations, yet settlement residents were continually offered less than this through the various housing programs. Mobile units were considered unacceptable for teachers but continued to be implemented for residents. A study done on housing in the settlements in 1977 indicates that, at that time – two years after the teaching housing report, the Emergency Trailer Program (ETP) was “the only program providing new additional housing stock to the settlements.” (7) Between 1976-77, 9% of the housing stock (or 47 new homes) were added to the settlements through the ETP (8) despite the above noted condition of the “built-in psychological effect of impermanence” that was determined unacceptable for the teachers. Finally, it is essential to note that, consistent with the other settlements, there is clear evidence of design-thinking at Peavine amongst its residents when given the autonomy to design and build to suit their own needs and desires. Many residents have built additions to their homes that directly respond to their need for more storage or improved connections to the landscape. In all of the cases below there is an extension of the home through the addition of a transitional indoor/outdoor space. These additions suggest a desire for a covered space that exists in the liminal zone between in and out. Residents have also built structures for various other purposes throughout the settlement – for added storage, fire, and buffalo meat smoking, for instance – that offer a glimpse of vernacular design, of Peavine residents designing and building structures or objects to better suit their lifestyle. And lastly, there is clearly a sense of material expression evidenced in Peavine that is unique to other communities in the area. For example, the expression of construction on the exterior wall of this house (below) and the adhoc construction of the building suggest something that is neither traditional nor contemporary but somewhere between. 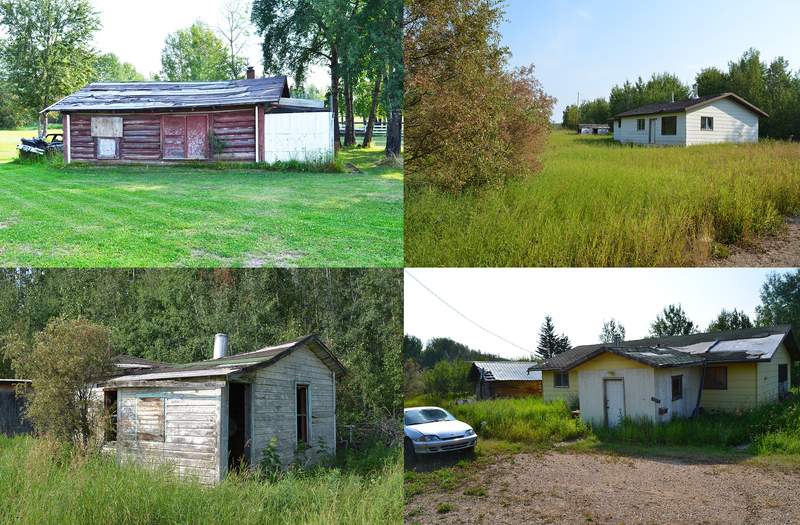 From a design perspective, as we have seen in other settlements, examples such as these suggest the possibility of a distinctly Métis way of design thinking and building in the Alberta settlements that warrants further discussion in relation to the greater research questions. (1) Kryzanowski, T. 2009. 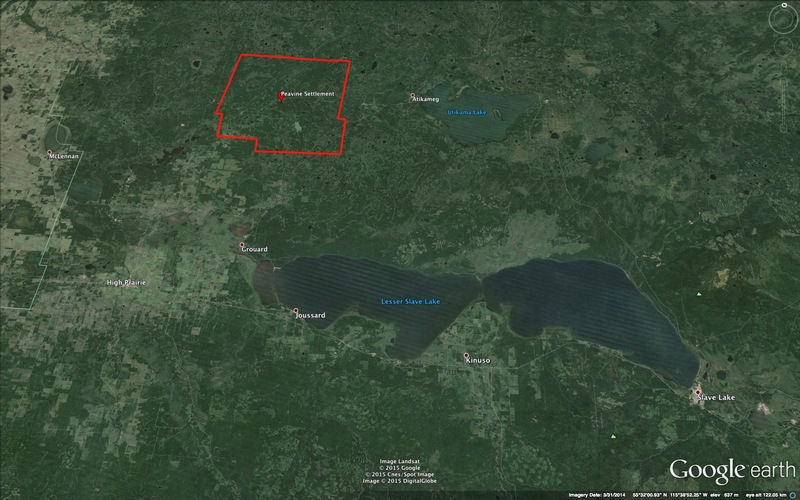 “Landmark forestry agreement in Alberta.” Logging and Sawmilling Journal. Available online here. (2) Boddy, T. 1988. 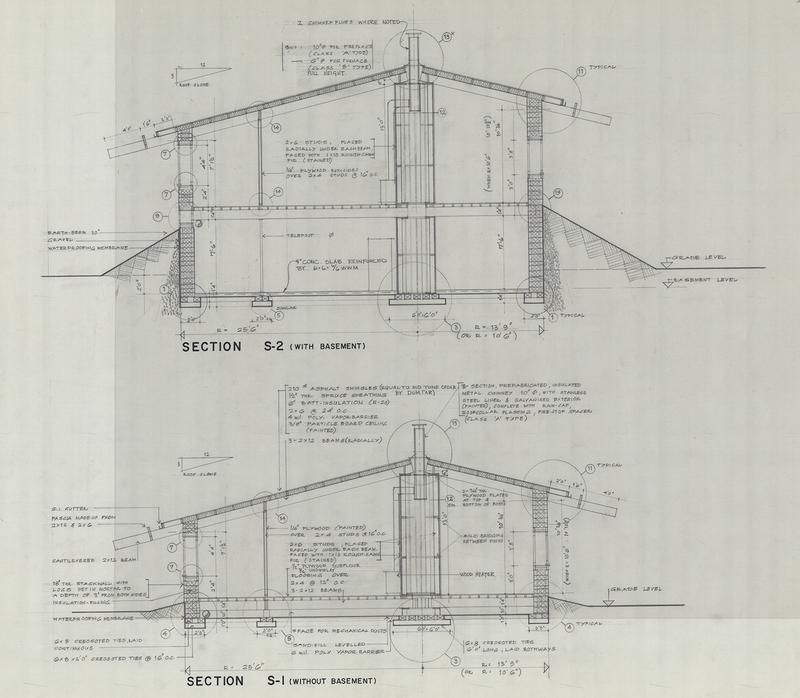 The architecture of Douglas Cardinal. Edmonton: NeWest. p. 75. (3) Quoted in Swift, W. H. 1975. Report of the Northland School Division Study Group. Edmonton: Alberta Department of Education. p.11. (4) Swift et al. 1975. p. 97. (7) St. Germain, S., & Bairstow, D. 1977. 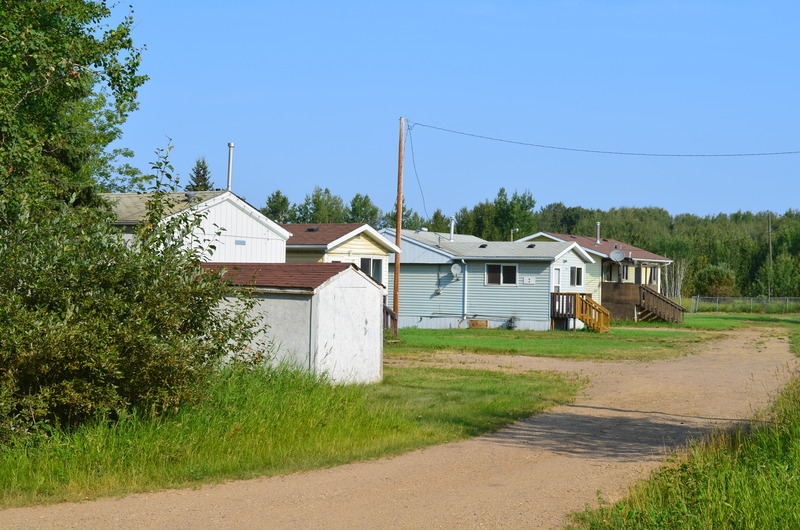 Metis settlement housing study, July-August 1977. Edmonton: Dept. of Housing and Public Works. Policy and Program Development Branch. p. 29.